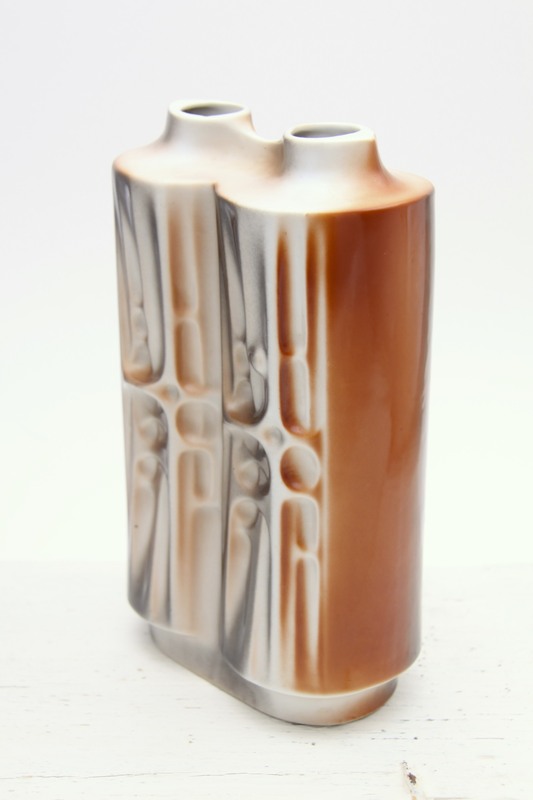 This is a Great porcelain double stem vase, made in Alba Iulia, Romania circa 1970’s. Exact maker unknown. A Fantastic piece with its twin tower / double stem form, wonderful abstract / geometric / architectural relief detailing. Very much in the Eastern Bloc Brutalist / Modernist style, very sculptural and owing much to the designs of Bertoncello. Lovely glossy glazes in banded vertical shades of black, beige and brown, very reminiscent of the era. A Striking display piece, makes a statement in its own right, would make a great centrepiece. 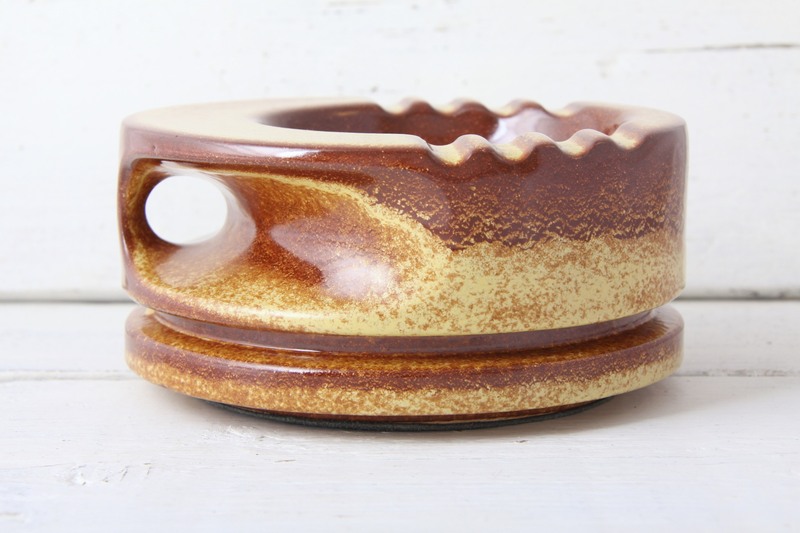 Would make a Stunning addition to any collection of European pottery, and would complement any retro, vintage, Brutalist, Modernist, 60’s, 70’s, minimal or contemporary styled interior. Measures 22 x 13 x 7cm / 8.75 x 5 x 2.75in. Stamped makers mark to the base, partly blurred ‘Alba Iulia’. This is a Stunning and Beautiful Bertoncello large sculptural ashtray / bowl, made by the Italian pottery circa 1960’s / early 1970’s. An iconic sculptural piece of Retro Italian ceramic design by the famous Bertoncello Ceramiche D’Arte. In their trademark style abstract and sculptural and modernist. With dramatic curves, rounded corners, pierced holes and geometric, monumental forms, recalling the works of Henry Moore and Barbara Hepworth and architecture of the era. Very Space Age / Op / Pop Art in form with its circular form, the top having an offset circular bowl and 4 cigarette rests on each side, themselves a striking graphic design. The sides have cut out recesses and a hole / handle, all wonderfully rounded giving a stylised ‘double decker’ appearance. 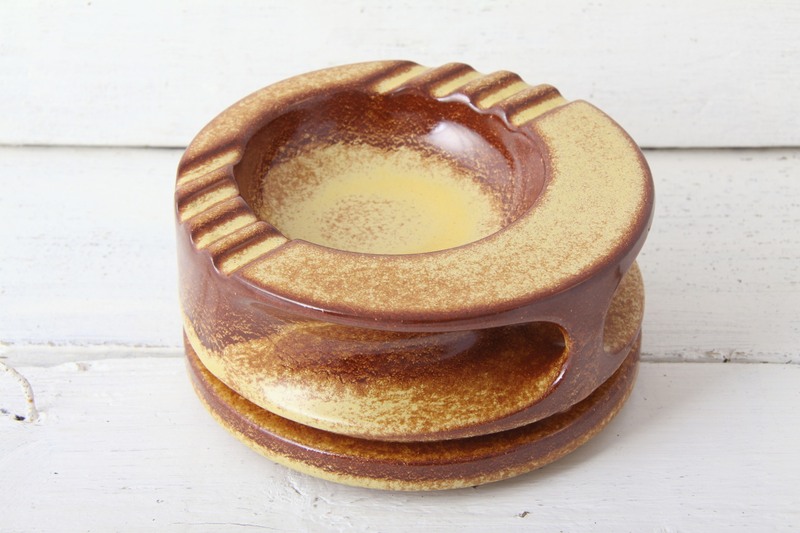 Fabulous mottled brown and beige glazes ‘Tabacco’ style, reminiscent of ‘Fat Lava’ pottery. 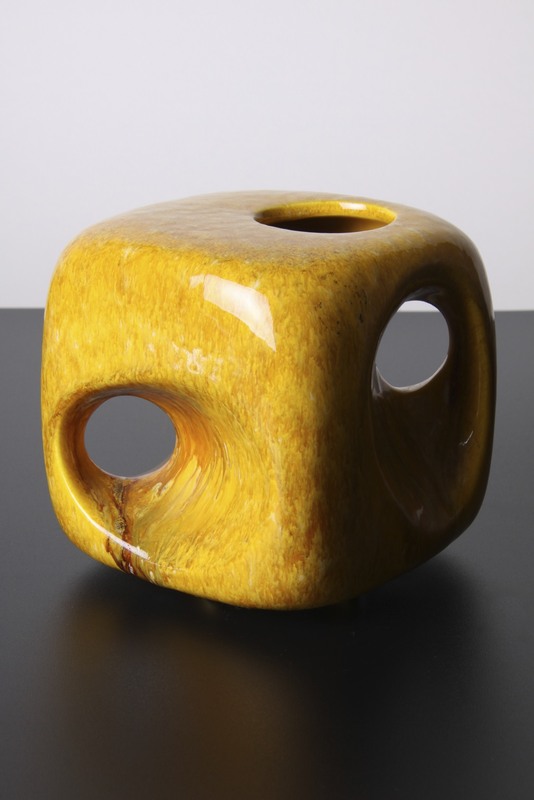 Due to its highly sculptural impressive form this piece could be used for its original purpose, or as a candleholder, display piece, desk / table accessory or centrepiece bowl. 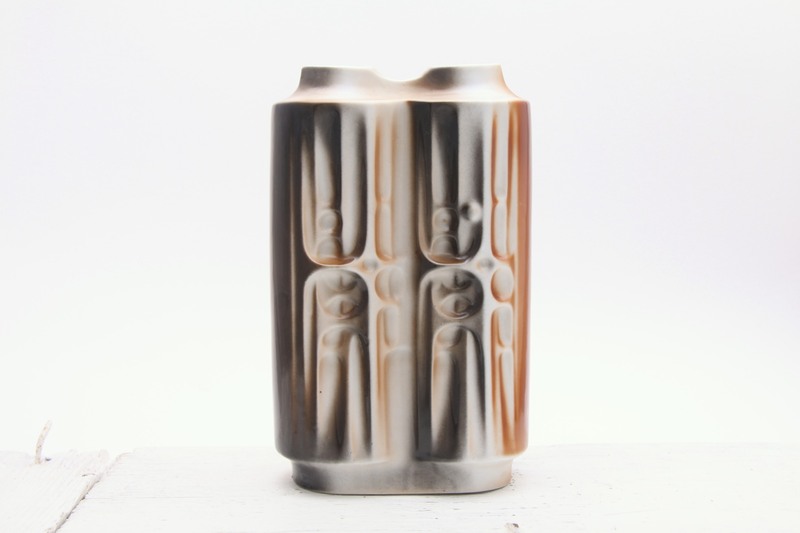 A Wonderful stylish piece that would be great as part of any collection of Italian or European Art Pottery, and would complement any retro, vintage, mid century, modernist, 60’s, 70’s, minimal or contemporary interior. In Excellent Condition, no marks, chips or scratches, hand painted mark inside ‘897’. The bottom rim has a felt pad to prevent scratching. Measures 19 x 19 x 8cm / 7.5 x 7.5 x 3.25in. 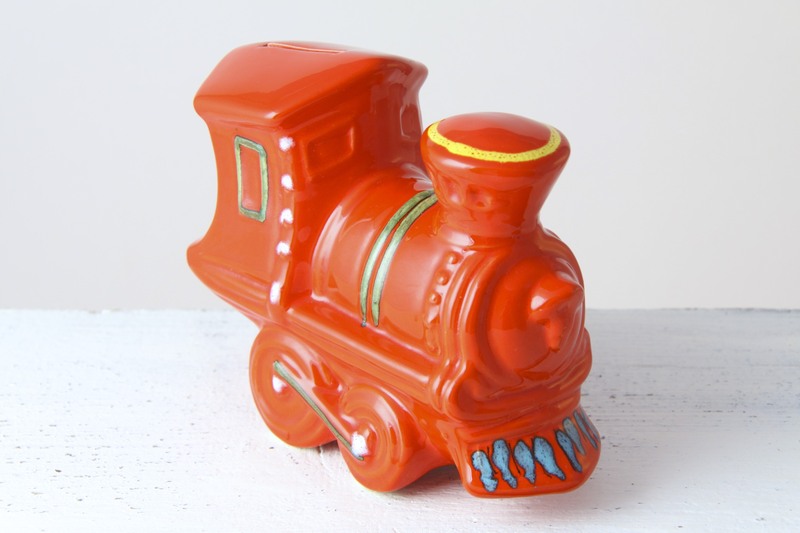 This is a Stunning Train money box / piggy bank, attributed to Bertoncello Ceramiche D’Arte, Italy circa late 1960’s / 70’s. 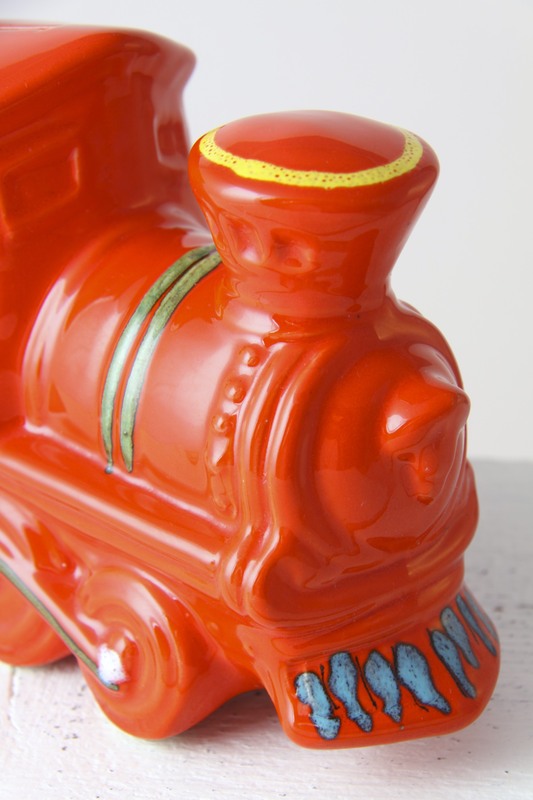 A Wonderful stylised form, the lovely cartoon like Locomotive / Steam train has great detailing, a slot in the top for coins and a stopper on the base. In a fantastic Bright and Glossy orangey red glaze, with handpainted details in green, white, and fantastic blue and yellow foamy glazes, very reminiscent of the Pop Art / Flower Power / Psychedelic era! Pieces with this glaze and decor were made by the renowned Bertoncello during this period, and are scarcer than their more subdued pieces. Would make a Great addition to any collection of money boxes, piggy banks, Italian or European pottery. Perfect appeal for a kids room, or as home decor for any 1960’s / 70’s / pop art / psychedelic / Mediterranean / minimal or contemporary interior. In Excellent Condition, still has the original stopper, no chips, marks, scratches or crazing. Measures 16.5 x 7.5 x 12cm / 6.5 x 3 x 4.75in. 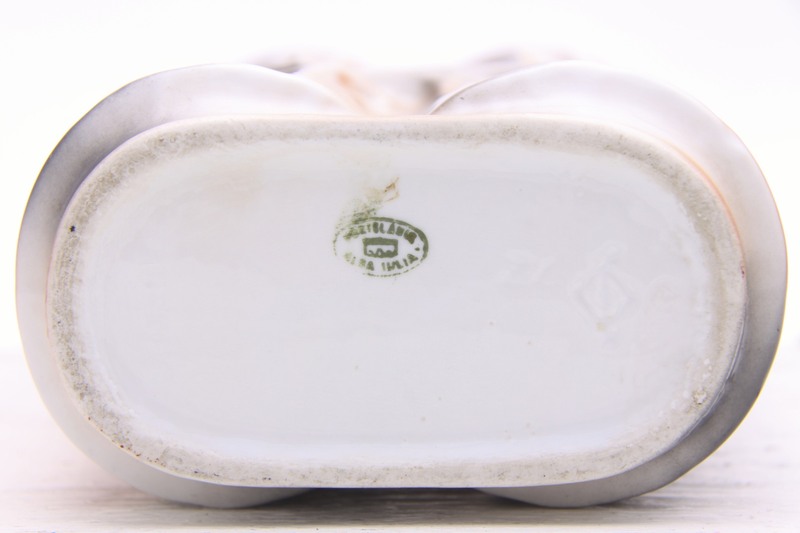 The base is hand marked 014 ITALY and is made using white clay, as is characteristic for this output.